If you have studied Chemistry in your elementary classes then you probably heard about acid, bases, and salts of different kinds. Citric acid is one such acid but is an organic one. The popular source of Citric acid is citrus fruits. This acid is a component of all aerobic living organisms. Considered as a weak acid due to its high pH, this acid has been consumed as an additive in processed foods from more than century onwards. It is used an emulsifying agent, as a preservative or a sour flavoring because of its excellent preservative properties In most jarred and canned foods you can find citric acid as it useful to prevent botulism. Carl Wilhelm Scheele first isolated this acid from lemon juice in 1784. This doesn’t mean we don’t know about its usage. But this achievement confirmed the nature and properties of this acid. The industrial-scale production of this acid began in the late nineteenth century and for this Italian lemons were used. Why is Citric Acid essential for the body? Citric acid is also found in the human body and it is highly important for producing the energy that keeps your body active and healthy for all day long. Citric fruits are tasty and safe for human consumption. Another most important thing about this acid is its antioxidant nature. These antioxidants are necessary for building up the immune system of our body and further help to maintain the pH levels of your digestive system. According to the Experts, citric acid easily mixes with minerals and essential metals and thus facilitates their absorption in the body. Consumption of Citric acid and its presence in adequate amount in your body ensures proper functioning of the kidneys. It further prevents the formation of kidney stones. It contains alkalizing properties and has a unique ability to bind to calcium. Thus it is high of useful for treating kidney ailments. This organic acid is an antioxidant and can successfully neutralize the life-threatening effects of free radicals. These Free radicals are a type of unstable compounds which are the main reason behind the growth of cancer and other tumors. In face packs and skin products, Citric acid is a common ingredient. It has positive results on human skin and hence it has wide applications too. From slowing down the aging process to the regeneration of skin tissue we will discuss all it. Ever noticed Citric acid is one of the important ingredients of cough drops and other Sore throat medications. This is so because it can successfully reduce the inflammation which is usually caused by tonsillitis. It is recommended to gargle with the combination of water and citric acid to clear the throat infection. Doing such will killing infection-causing germs. By reducing the gastric acidity Citric acid can alleviate nausea. For acne prone skin we will suggest you go for a simple citric acid & milk mask. In a bowl, add 2 tablespoons citric acid powder, ¼ cup water, ¼ cup low-fat milk then stir. After mixing well you can apply the mixture and leave for 15 minutes.Then wash off gently with lukewarm water. Fist, take a saucepan, add, 2 tablespoons citric acid powder,½ cup orange juice, ½ cup water and also a packet of gelatin(unflavored). Stir this mixture on medium heat until all the ingredients dissolve and mix well. Then put the gas off and let the mixture cool down. After that refrigerate it for 20-25 minutes. Use this mix as a face mask and put it on for 30 minutes. You can easily make a scrub for uneven skin tone using citric acid. To do this take a bowl and add ¼ cup plain curd, 1 tablespoon of citric acid powder and 2 tablespoon oats. Then just Mix all of them well. Before application, Firstly Moist your skin a bit then apply it and Gently massage in circular motions. A good anti-ageing face mask can be prepared by combining Citric acid with other ingredients. First, crush some citric acid crystals into a fine powder. Add this powder with some yogurt and honey and also add a vitamin E capsule. Mix all these ingredients well in a bowl and then you can apply it on the skin. For providing a Tangy Sour flavor the Citric acid is usually preferred in many beverages too. The speciaIity of this acid is that it has a natural sour taste. Hence it is widely used for flavor the candies the orange or like the lemon. Citric acid is added to processed food and this is done during the canning process. The addition of this Citric acid helps in maintaining a healthy pH balance inside the foods products and also helps to increase their shelf life. In the preparation of homemade jams, sugar syrups or ketchup, you can add the citric acid powder to prevent your sugar being crystallized. This will also improve color and flavor of your dish. As citric acid is a natural disinfectant it can be used for cleaning purposes as it effectively kills bacteria, mildew & molds. 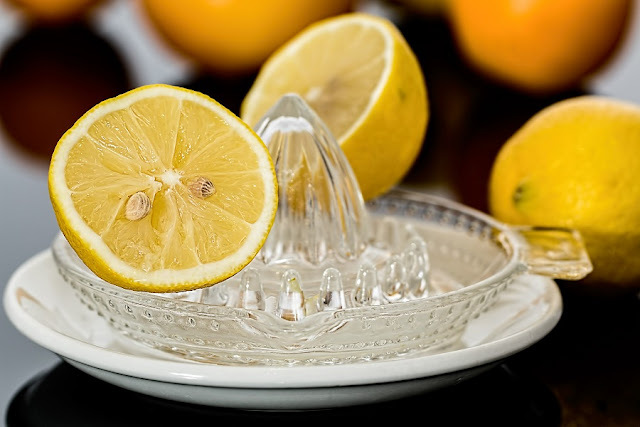 We often hear in the advertisement the dish washing bars having the lemon but it actually the Citric acid which does the job. In lemon or lime soaps and bars, citric acid is added. Citric acid is widely used in auto cleaning products all-purpose cleaners, soap scum removers, air fresheners, window cleaners, stain removers, metal cleaners, oven cleaners, tub & tile cleaners, carpet cleaners, dishwasher cleaners, bathroom cleaner dish soaps, laundry detergents etc. Yes, It is true that excess of everything is bad and it is equally applicable in this case too. • Weak hair: breakage, discoloration and hair degradation. You can buy pure citric acid in any drug store, Local health food stores near you. Some natural sources of citric acid are oranges, lemons, limes, and tangerines. Online you can buy citric acid from Amazon, ebay etc.